It’s no secret that higher education is the ticket to a better life. Students who attain degrees — two-year, four-year or postgraduate — earn more and live longer. College helps families pull out of poverty, and the effects of education are felt across communities and through generations. This was true in 1958, when Scholarship America was founded to help give more students access to college. And, as these five numbers show, the vital importance of college education (and scholarships) is even greater today. The recession of 2008 saw the disappearance of 5.6 million American jobs that didn’t require a college degree. These jobs provided skilled and experienced laborers a chance to earn a living wage without going to college — but, even as the economy recovers, most of them won’t be coming back. 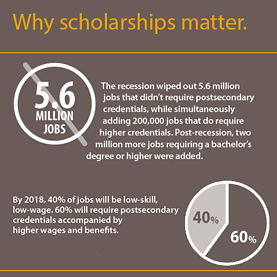 The face of United States business has changed; even while these jobs were disappearing during the recession, 200,000 new positions were created that require postsecondary credentials. Since the recovery started, that figure has ballooned to more than two million. By 2018, six of every 10 American jobs will require some form of higher education — and the nation may not have enough skilled workers to fill them. If a student enters college and doesn’t earn their degree in six years, it’s unlikely they’ll ever do so. Unfortunately, this is exactly what’s happening to almost half of the kids that start their postsecondary education: Only 56 percent of four-year university students in the U.S earn their degree within six years. It’s even more dire at two-year schools, where only 30 percent of students complete their education within three years. Students drop out for many reasons, of course. But the number-one reason students cite for having to quit? The need to work while attending school. As costs skyrocket, it’s becoming impossible to pay for college without working — but long work hours make it harder and harder to devote time to class and activities. Depending on the terms and the amount, student loans can be a useful part of the college payment package. But relying on loans can also saddle students with decades of debt, and dropping out can leave them without the earning power to pay it back. In 2013, for the first time, grants and scholarships became the single biggest way students paid their tuition and fees. Sallie Mae’s “How America Pays for College” study revealed that 30 percent of the average bill is being covered by grants and scholarships, with parental borrowing taking care of 28 percent. A college education is increasingly crucial. Scholarships are an increasingly important way to pay for that education. And supporting Scholarship America is one of the most effective ways to contribute to scholarships. We have distributed $3.1 billion to students since our founding, and we provide local, national, corporate and foundation-based scholarships across the nation and around the world. Through the Dream Award, our new national scholarship program, we’re expanding scholarships to students who are already in college but may be struggling to finish. Our Dreamkeepers program grants emergency financial aid to students at risk of dropping out. And our goal for the next decade is to help 750,000 students focus on the finish line, and complete their postsecondary education with manageable debt. 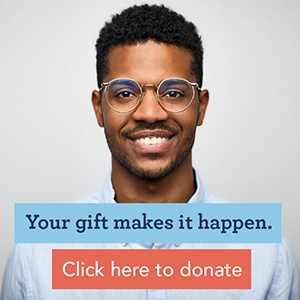 To join us in these efforts, you can click below to make a gift; you can also sign up for our e-news, learn about volunteering or check out our 2013 Annual Report!